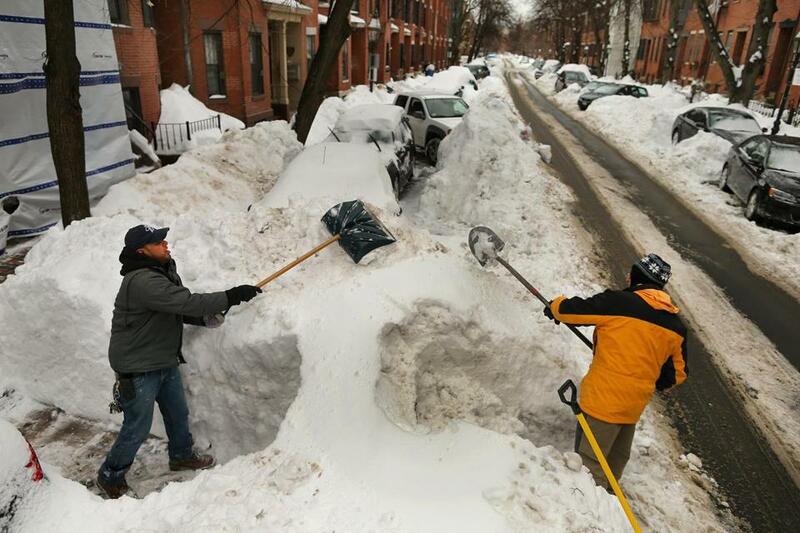 There were no smiles as people continued to dig out in Boston. The art of complaining about winter weather is something New Englanders consider themselves quite good at. This is sort of true. We are, as a people, consistent complainers, though the articulation of those gripes usually falls short on originality. At this point, there is little new to say about New England winter, but that will never stop us from saying it anyway. We never grow sick and tired of complaining that we are sick and tired of being sick and tired. The beauty of winter complaining is that it can, at first, feel fresh. The first nightmare on the MBTA might make you feel like you were complaining about the MBTA before it was cool to complain about the MBTA. The first space-saver in Southie might inspire you to pull out your phone and post a photo on social media and argue how this practice makes sense/makes no sense. The sight of empty shelves of bread and milk at the grocery store might cause you to think you’re the first person ever to make a joke about why there’s always a run on bread and milk. But that ends. That becomes monotonous. And then everything becomes monotonous. At some point, it feels like Groundhog Day, and then it actually is Groundhog Day. Coincidentally, that is right about the time this winter became stupid. There was a ton of snow. Then there was a ton of snow. Then there were a few days when all anyone could talk about was how there was no place to put all the snow. The Super Bowl came, which was nice, but now the Super Bowl is gone, and everything is just a mess, and complaining about it begins to feel as pointless as washing your car. 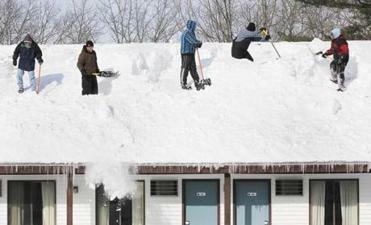 The additional snow could place even more stress on overloaded roofs and already-clogged city streets. There are still noises to be made, typically from the guttural end of the register. They are the noises you make when you have to crawl out the other side of the car because you can’t open the door next to a snow bank, or when you have to carry your dog because its legs are not long enough to make it through the drifts. They are the noises you make when you realize when the MBTA speaker announces that there are “significant delays.” They are the noises a body makes when it must complain and has run out of things to say. But we are “hearty New Englanders,” we tell ourselves. We live here because we like four seasons. So we keep our heads down and our shoulders hunched. We climb over snow banks to get to more snow banks. We squish onto subway cars and abandon any concept of personal space. We buy more bread and milk. We survive on the bright spots. The optimism of pulling a board game out of the closet on a snow day. The sweet nostalgic concept of hot chocolate. The bracing experience of real cold, where the simple act of making it indoors can feel like a congratulatory pat on the back for surviving a life-or-death situation. And we look ahead. To April. To warmth. To all the vague plans of what you will do outside when going outside sounds like a pleasant idea. So we trick ourselves into thinking it’s not that bad; we might even believe it. And then it happens: the forecast comes and it’s stupid. A “72-hour event” is on the way. Three separate snowfalls predicted between Saturday and Monday, adding up to another foot or so. With it come warnings not to use roads that have only just become usable again. Suddenly, it’s back. The complaints become audible again. The gripes feel original. The whole thing starts to feel personal. It doesn’t feel like winter. It feels like a punishment. And you don’t mind saying you’re sick and tired of being sick and tired. 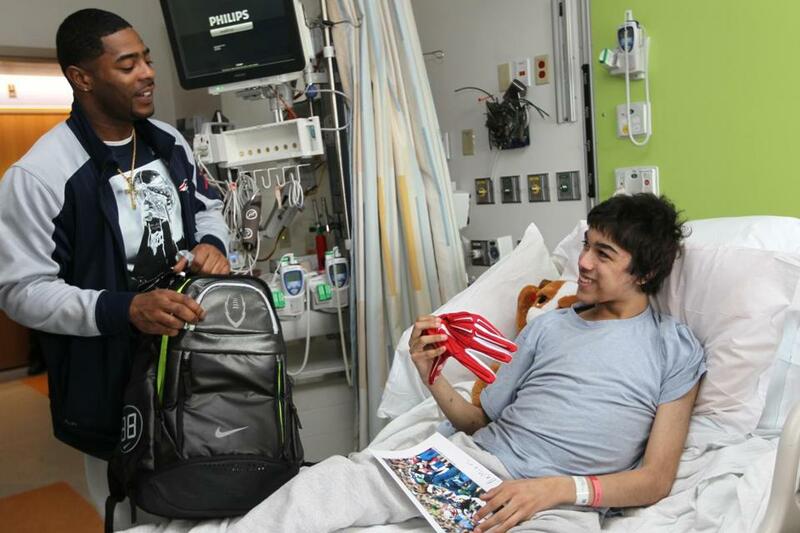 Super Bowl hero Malcolm Butler (left) brought a smile to patient Damian Ortiz at Children’s Hospital on Friday.